A beautiful haircut can instantly boost a person’s confidence. And knowledge on the trade can provide them not only confidence but also source of livelihood. 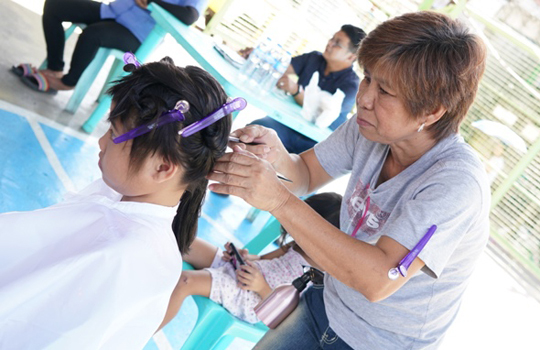 Earlier this year, hairbrushes brand Denman and nonprofit organization Hair Aid went to Barangay Nagkaisang Nayon in Novaliches for a haircutting community program. Denman Philippines ambassadors Lourd Ramos and Anton Papa, along with a handful of Hair Aid volunteers, headed by Lisa Polini, lent their expertise in a week-long workshop that taught participants about the proper tools and techniques in cutting hair. More than 25 participants gathered at the basketball court of Brgy. Nagkaisang Nayon for the program, which offered unemployed men and women the opportunity to learn new skills for livelihood. Hair Aid, established in 2010, has been offering its services in Metro Manila and has been working with Denman Philippines for the past three years. Since its inception, Hair Aid has helped over 2,300 individuals in Quezon City, and in its recent tour, aims to train 210 more. “With Hair Aid, we want to go beyond mere charity and dole outs. We want to empower men and women by providing them the skills for livelihood. We started teaching hair cutting classes here because it’s a much-needed service that can be learned, and everyone needs a haircut,” enthused Hair Aid founder Selina Tomasich. Twice a year, Hair Aid heads to Manila to train Filipinos. In addition to the Philippines, Hair Aid also hosts programs in Thailand, Cambodia, and Indonesia, and soon Vietnam. Selina and Hair Aid volunteers offer their time and expertise for free, even raising their own money and airfare so that they may share their gifts. Polini, for instance, flew all the way from Australia to be one of the 20 stylist-teachers at this workshop. 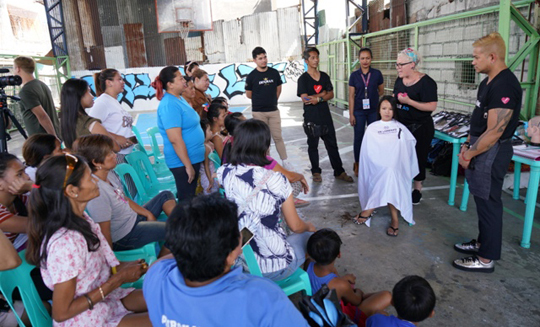 Hair Aid volunteer Lisa Polini and Denman Philippines ambassadors Anton Papa and Lourd Ramos lead a hair-cutting workshop in Novaliches, Quezon City.